Barrenwort (Epimedium): growing, planting, caring. Fairy wings - delicate in appearance, and in maintenance. Epimedium - the barrenwort - is a genus of flowering plants in the family Berberidaceae, with most species endemic to China. Epimedium species are deciduous or evergreen hardy perennials growing from an underground rhizome with typical four-parted "spider-like" flowers in spring. Some species have been hugely popular as garden plants for centuries in Japan, and they are only just beginning to garner attention in the West. Perennials of the genus Epimedium, or barrenwort, have small pendulous flowers in a flattened section, with 4 or 5 spurs. Their leaves are base-shaped, sometimes pinnate, pointed at the top, basal. Flowering is occures in spring in clusters or in panicles. Barrenwort grow better in a sheltered, semi-shady spot, well-drained - sandy - rich and fresh without stagnant water. Plant the barrenwort close, every 20 to 40 cm, in a light soil. In heavy soil, add gravel to the bottom of a hole 40 cm deep. Water well, then mulch plenty. Water twice a week during the first month. After that, you will just need to water in case of drought. 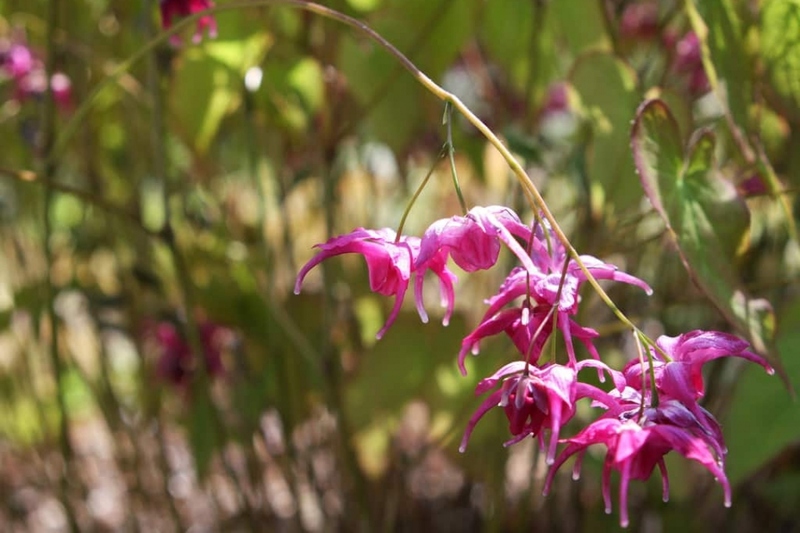 The easiest multiplication method to multiply your epimedium is to divide them in autumn or after flowering. To do this, take the roots out of the ground, slice the root ball by the middle, then replant with 30 cm intervals. Mulch under barrenwort: they do not grow very dense, so it will prevent other plants to emerge between your crops. In autumn, a thick mulch will protect the most fragile varieties of cold weather. When spring returns, remove the dry leaves from the previous year, this will make your barrenwort better looking.